Coral reefs are currently facing a bleak future as trends in global warming and human activity threaten their existence. As ENN reports, “More people means more of everything that damages coral reefs, including fishing, sewage, coastal construction and human activities that contribute to warming oceans.” There have been many efforts to combat this decline by creating artificial reefs out of a wide range of substances. These structures are essential since reefs can’t spring up just anywhere and need to attach to some sort of solid surface. Strange as it may sound, old MTA subway cars happen to make perfect starters for these underwater ecosystems. The undersea residences are 100% recycled, prefabricated, and the rent is right since New York is giving the cars away free of charge. The reef is currently composed of 714 cars and continues to grow, creating “a thriving community in what was once an underwater desert”. Everything is energy-linked, in that energy is either "sequestered" or "emergent". The energy-cost of recycling the steel railcars (transporting, scrapping, etc.) may be outside the efficiency-capability of our current system, i.e., not cost-effective and wasteful of carbon resources. Think of the reef as a way of returning the iron to the earth in a way that is supportive of planetary habitat. Bringing a fishing reef in closer to shore off Delaware/New Jersey restores what had become a fished out area (think of those trawlers going far afield to hunt fish) is a good global plan. seems people are on one side or the other when it comes to this. Am I the only one that seems to be on the fence about it? I see how this can be good, but i still see how this can be a mess. 1) these weigh a massive amount, shifting in the sea won't be a problem 2) the minor asbestos they have i'm sure was removed. I've seen it when they sink the old aircraft carriers, they have to remove almost everything! not to mention asbestos is an airborn problem 3) is this metal approriate for this kind of solution, or will it become a rust bucket and polute the water in the end? 4) is this the best thing to be using. why aren't we using the concrete reef balls that have become so popluar over the years? 5) why aren't we usign the metal for something else. recycle the metal and reuse it to make the new train cars no? 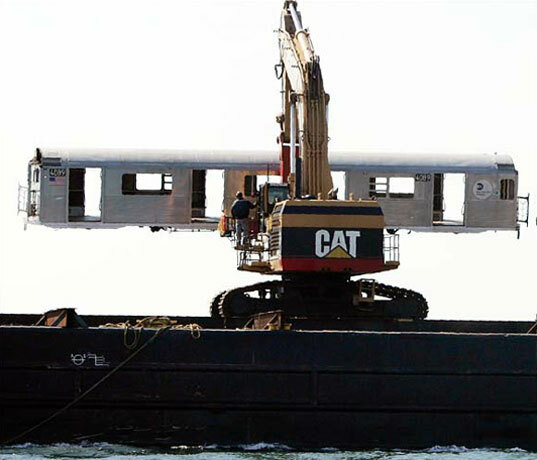 I also had a strong negative reaction to the idea of dumping old subway cars into the ocean and a lot of issues came up for me that others have mentioned here. However, instead of freaking out, I believe we should research the issues to which we take offense before we decide that this (or anything) is categorically wrong. One of the most exciting things about environmental industries right now is that we are relatively new so people aren't able to say, "This is not the way we have been doing things for 50 years so it's not going to work." Instead, I find that more people are open to the inspired ideas that emerge out of the sort of collective brainstorming that the green movement fuels--surfboards made out of sugar? wallpaper made out of sunflower husks? cars fueled by chocolate waste? and, many times, delighted by the innovation. In short, I would hope that we are wary of becoming reactionary instead of using distasteful ideas as jumping-off points for better ways of doing things. Good article from Scientific American: http://www.haraldfranzen.com/articles/sciam-subway/sciam-subway.htm End of rant. One concern: an article in the NYT says, “The reef, named after New York City’s famous Redbird subway cars, now supports more than 10,000 angler trips annually, up from fewer than 300 in 1997. It has seen a 400-fold increase in the amount of marine food per square foot in the last seven years, according to state data.” Is this reef going to end up being bad for the environment by attracting so many people and gas-fueled vehicles to the site? Is the purpose of this reef to encourage a new ecosystem or to provide food for humans and stability for the fishing industry? I haven't been able to find an answer to the following question, so if anyone knows, please post: Why was the area barren? Was there an existing ecosystem that was destroyed by previous human activity, or is this (the barrenness) a natural occurence? If the area is naturally barren, will developing a new ecosystem here create an imbalance elsewhere? I'm appauled. these should be recycled. These materials are valuable resource with embodied energy, water and carbon. If we carry on like this we will use up the planets materials resources and there will be no return. How to throw garbage at the sea with the blessing of the community. That\'s brilliant, I love it. I guess we could do the same with planes, boats, caterpillars, construction leftovers or cars. Well, let\'s consider recycling problem is now solved for anything that can contain a fish. Just thow it at the sea, it makes a \"perfect starters for these underwater ecosystems\". Why should we have a design competition to design better structures? That only means more manufacturing, more costs and subsequently a worse environment. If we can kill two birds with one stone by getting rid of 'junk' and building a reef system, provided the junk doesn't have any ill effects on the environment, then why shouldn't we? As much as I love to see us using our \\\"trash\\\" in a positive way and trying to come up with solutions to issues, the first thing that I thought when I read the article was that there has got to be something damaging about that. I cannot believe that dumping those cars into the ocean would have zero negative effect on the enviornment. I wonder how much research has been done on the long term problems with this solution. perhaps someone should host a design competition to design reef building structures. Seems we could use some ideas that aren't made with our junk and expensive materials like metal. Hi folks, Just a few points for consideration here in response to the waves of discontent: 1. The cars have created a viable ecosystem where there was none before. The underwater location used to be a barren stretch of sand. 2. The cars are massive, so they're not going to go washing up on beaches as in the tire reef debacle. Should they shift, the area around them is in effect the reef they created (existing coral reefs won't be harmed). 3. As to the asbestos content of certain cars, it's certainly an important consideration. The old redbird cars do contain small amounts of asbestos, although state officials have stated that it's not a threat to marine life, and asbestos must be airborne to be a threat to humans. Take that with a grain of salt; New Jersey has refused to use the Redbird cars because of environmental concerns. they tried this with tires: http://www.usatoday.com/news/nation/2007-02-17-florida-reef_x.htm and it proved to be a disaster. I thought this practice of reef-rebuilding was discouraged because powerful tides can move these unanchored structures causing them to roll around and destroy existing reef? These subway cars contain asbestos, something bad. I can't help but cringe when I see our stuff dumped in the water like that. It might be better than nothing but there has got to be a better way. 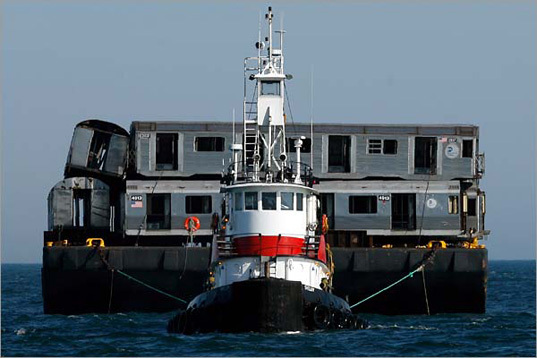 It's a condo boom for sea creatures as retired New York subway cars are being hurled into the ocean deep. The initiative, headed by the Delaware Department of Natural Resources and Environmental Control, has deposited hundreds of the vacant vessels in an effort to jump start a new reef 16 miles off the state's coast. The concept has already shown great promise, transforming "a barren stretch of ocean floor into a bountiful oasis, carpeted in sea grasses, walled thick with blue mussels and sponges, and teeming with black sea bass and tautog."